In 2006, the Australian Federal Government made family mediation compulsory before pursuing litigation concerning parenting matters. Since then, much has been written about the benefits of mediation, such as the advantage of parents being empowered to make their own decisions rather than have the decision made for them by a court. The benefit of listening to children in family law court proceedings has also spawned considerable useful literature. However, less attention has been given to the importance of empowering children to participate in the decision-making process in matters affecting them before the matter reaches court. Giving children a voice in the pre-trial stage is particularly important now that mediation is compulsory and because most family disputes are settled outside the courts. Accordingly, this article focuses on the pros and cons of including children in family mediation. 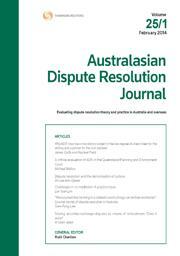 It also highlights how, when implementing family law reforms, Australian legislatures missed the opportunity to promote a culture of child inclusion in mediation. A child inclusive culture would have been in furtherance of Australia’s international law obligations to protect children’s participatory rights in matters affecting them. Mediation is a process that provides opportunities for parties to civil disputes to engage in dialogue that can satisfy their expectations and needs for apologies. This article provides an overview of the apology and mediation literature in which these benefits and concerns are explored and the psychological research that reveals the complexity of apologies. The article uses a detailed case example that illustrates this complexity and indicates ways that mediators working with parties in mediation who have indicated that apologies are important to them, might work with this. The article also reflects on the ways that the law interacts with apologies in the mediation of private law disputes and concludes that the law plays a significant indirect role in supporting parties who seek an apology as an outcome of mediation. From the outset, dear kind and gentle reader, rest assured that this brief article is not weighed down with complex statistical data derived from rigorous and extensive research. That is not to say that this article is devoid of research. However, the research conducted for this article is no more complex than simple Google and database searches. The genesis of this article was the announcement by the Chief Judge of the Federal Circuit Court of Australia that each registry of the Court would hold a callover of all matters listed for hearing and that all suitable matters would be referred to family dispute resolution. It soon became apparent that no single, accurate database of private family dispute resolution practitioners existed. With that discovery came the realisation that while a broad and professional body of family dispute resolvers exists there remain substantial practical barriers impeding family dispute resolution from achieving its full potential. It is those barriers and how they might be and why they should be overcome which this article will discuss. Default proceedings in arbitration, where a party fails to participate in the arbitral process, appear to run contrary to the consensual nature of arbitration, which is premised on the parties’ agreement to submit their dispute(s) to arbitration. Consequently, default proceedings pose due process concerns due to the absence of the defaulting party in the proceedings. At the same time, it is imperative that the arbitration proceeds in a timely manner without undue delay and is not stalled simply due to the refusal or failure of one party to participate in the arbitration. This article looks at the conduct of default proceedings in the arbitration in the face of these competing considerations. It then turns to some of the challenges and limitations presented by default proceedings and explores possible measures to manage the challenges of default proceedings. The question of what makes mediation an appropriate form of dispute resolution in a civil dispute is an open one, and our answers have continued to evolve over time. This evolution has run in parallel with our changing understanding of the reasons people litigate and the underlying motivations for choosing court over settlement. In a commercially driven society, financial reward is the most obvious and most called-upon answer. However, our tendency to see the world through a pecuniary lens risks us overlooking the importance of victory and vindication, particularly in cases where a plaintiff has suffered an ostensibly intangible harm, such as injury to feelings or reputation. The Victorian Supreme Court case of Von Marburg v Aldred (No 3) is one such case. Recent developments in the area of cognitive science suggest that we are considerably closer to a better understanding of how and why humans make decisions and the impact that emotions have on decision-making. Within the field of mediation, such developments can assist mediators to create an atmosphere within the mediation setting that supports agreement making and reduces the likelihood that a dispute will continue. Although such research is in some instances in its infancy, there is increasing evidence that emotions as well as biological factors are relevant in determining outcomes and that such factors can be affected by mediator interventions. Although more research is needed to adequately explore the effectiveness of specific interventions, developments in cognitive science suggest that some interventions are more likely to promote responsiveness to options and the development of agreed outcomes. For the PDF version of the table of contents, click here: ADRJ Vol 29 No 1 Contents.